With President Duterte’s declaration of a unilateral ceasefire, Mindanao ‘bakwets’ hope soldiers will leave their communities and they can finally go home. MANILA – As the people’s caravan, Manilakbayan ng Mindanao, arrives down south tomorrow July 30, the Lumád bakwets (evacuees), will be the most eager ones to get off the bus, which they hope will go straight to their mountain communities, their homes. President Duterte’s declaration of a unilateral ceasefire with the New People’s Army (NPA) in his State of the Nation Address (Sona) on July 25 had given them hope that the soldiers and paramilitary groups will leave their communities and they can return safely home. Kerlan Fanagel, chairperson of the Lumád regional group Pasaka day Salugpungan Kalimudan (Pasaka), said that in their meeting with the President after Sona, they were told that the evacuees’ safety will be ensured, even if not all soldiers are pulled out, or even if locally-recruited paramilitary men still remain in the communities. “They (soldiers) have to follow the law, they cannot encamp in homes,” Fanagel said they asked of the President, who agreed. This assurance, along with Duterte’s ceasefire declaration, is considered the biggest gain of the Mindanao people’s caravan, as it ended a 10-day campaign on July 28, bringing regional people’s concerns to the nation’s capitol, and culminating into one of the biggest Sona rallies. Some 2,400 bakwets are still in two evacuation centers: at the United Church of Christ in the Philippines (UCCP) Haran Center in Davao City, where 400 residents from Davao del Norte and Bukidnon have sought sanctuary since April last year; and at the Provincial Sports Complex in Tandag City, Surigao del Sur which still accommodates 2,030 Lumád from five towns of Surigao del Sur. 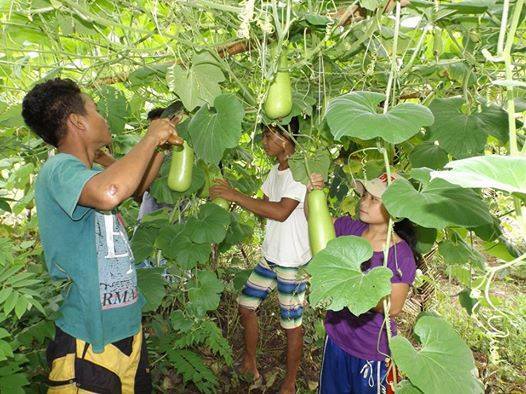 Students of the Alternative Learning Center for Livelihood and Agricultural Development (Alcadev) based in Han-ayan, Diatagon village, Lianga were among the Manilakbayan delegates. They have spent the last 10 months at the evacuation center in Tandag and they long to see their school again, even if it will bring back the horrid scenes of Sept. 1, 2015. The Surigao evacuees fled their homes on Sept. 1, following the attack in Han-ayan by the paramilitary Magahat-Bagani group, which killed Alcadev Executive Director Emerito Samarca and Manobo leaders Dionel Campos and Datu Juvello Sinzo. The evacuees numbered up to 5,000 as the operations by soldiers and paramilitary intensified in several towns. But many have eventually returned home. Yenyela Undayon, a 16-year-old 4th year student, already has a plan regarding the first thing she will do when they return to Han-ayan. “I will go to the school and help clean up, and also repair the dorm,” she told Bulatlat. “They said our garden is overgrown with weeds,” Undayon referred to a report by a fact-finding mission which recently visited Han-ayan. “Our books in the main building are all scattered and dirty,” she said. Panukmoan and Manluy-a communities. The Han-ayan community cooperative was also razed to the ground in last year’s attack. But the chores ahead matters little to the Alcadev students who have grown grit as intense military operations pushed them to repeatedly leave their communities for safer grounds, then return a few months later to rebuild. This has been the case since 2005, but this was the longest they have stayed in an evacuation site. Menirose de Castro, 16, another 4th year student, described their condition at the evacuation as “tiring.” She said it gets sweltering hot on sunny days, and when it rains, leaks plague the tent which serves as school. Alcadev started classes on June 15, with a total of 189 students in four levels. “We are like prisoners in a cell,” de Castro said. She said many have gotten sick. Aside from being exposed to the elements, they make do with the scarce supply of clean water, the lack of toilets and the regular fare of noodles and dried fish. The youths long for the comfort of their mountain home. Jesren Miniel, 17, also in 4th year, said he misses the abundance of water to drink and specially, to bathe. “We have a large river at home, unlike at the evacuation, where the water is scarce and dirty. At home, we have our forest where we can play,” De Castro said. She said she also misses the abundance of food, specially the variety of fruits, just for picking: bananas, mangoes, santol, langka and coconut. “There are fruits (in Tandag), but we have to buy them, and they’re not even fresh,” she said. Undayon said she misses Hubo river, the school’s rice and vegetable farms, which had produced food for students and teachers. As the Lumád evacuated as one body, so will they head home and collectively face the great task of rebuilding the communities. “Our communities and schools prove what we have achieved in the Lumád struggle for our right to self-determination. This is our victory and we will continue to defend it,” said Josephine Pagalan, spokesperson of Kasalo, the Lumad regional group in Caraga. This time, they will get aid from the Department of Social Welfare and Development (DSWD), as the President also approved the Lumád leaders’ request. 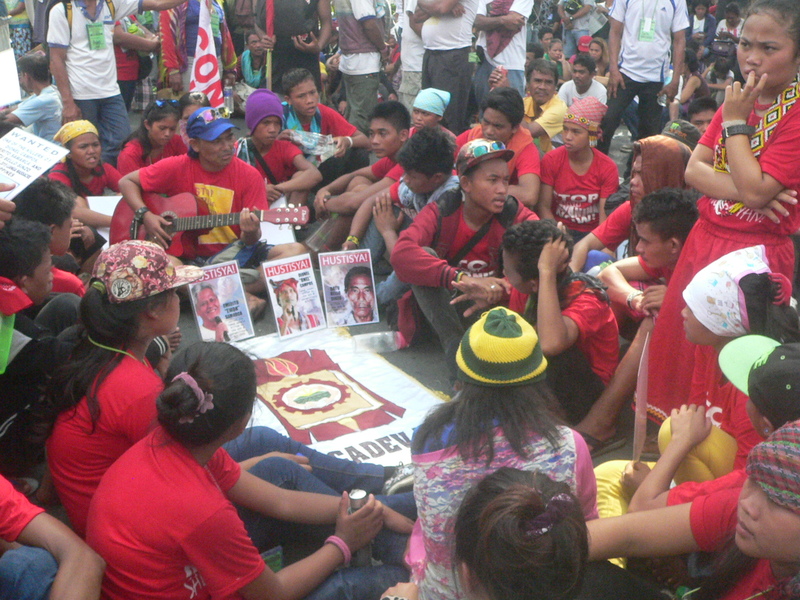 Pagalan said that their call for justice continues, specially for the three Lianga martyrs. “It does not end here, we want justice for the victims of Oplan Bayanihan, we demand to hold (former President Benigno) Aquino accountable… disband the paramilitary group, arrest the perpetrators, and pull out the soldiers, specially the 75th infantry battalion,” Pagalan said.